The September edition of Target Shooter, the FREE digital shooting sports magazine from the UK, is now available online. There are some excellent articles in this edition. On pages 61-65, you’ll find Laurie Holland’s comprehensive review of the Forster Co-Ax Press. This is probably the most thorough Co-Ax test you’ll see anywhere. Holland puts Forster’s unique reloading press through its paces — decapping, full-length sizing, and priming cases — and concludes that the press is a winner. If you’re considering buying a Co-Ax, this article is a “must-read”. Vince Bottomley contributes two major stories in this month’s edition. First, Vince reviews two Sightron 36X target scopes, comparison testing the new “Big Sky” 36X scope alongside the earlier Sightron 36X SII model. 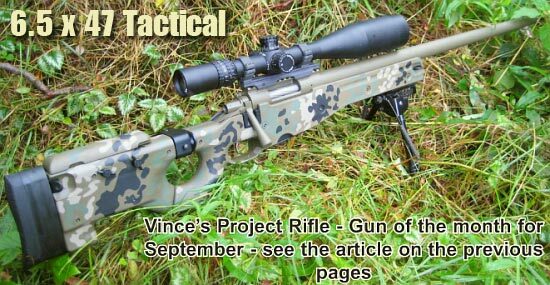 In addition, Vince showcases his latest project gun. This is a 6.5×47 tactical rifle in an Accuracy International chassis. Apart from the AI folding stock, the gun uses mostly American components. It features a Surgeon action, Bartlein gain-twist barrel, and Jewell trigger. The finished rifle sports a handsome Dura-Coat camo finish from North West Custom Parts in Manchester, England. You’ll find many other items of interest in this month’s Target Shooter e-zine, including a Benchrest Air Rifle, an intro to Gallery Guns, plus reports from the Imperial Match and the F-Class World Championships held in Bisley, UK. There’s 92 pages of reading, cover to cover, and the price is right. Target Shooter magazine is FREE, just CLICK HERE for the latest edition. 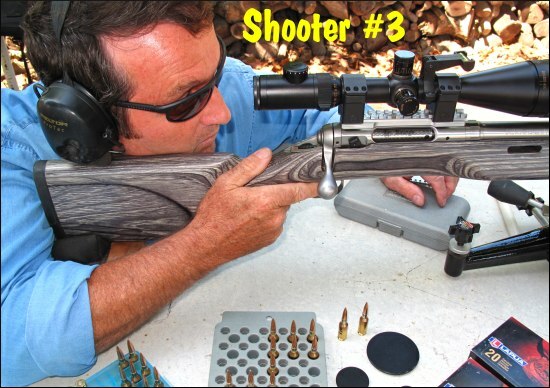 Share the post "Good Reading in September Target Shooter Magazine"
When developing a load for a new rifle, one can easily get consumed by all the potential variables — load weight, seating depth, neck tension, primer options, neck lube, and so on. When you’re fully focused on loading variables, and the results on the target are disappointing, you may quickly assume you need to change your load. But we learned that sometimes the load is just fine — the problem is the trigger puller, or the set-up on the bench. Here’s an example. We were recently testing two new Savage F-Class rifles, both chambered in 6mmBR. Initial results were promising, but not great — one gun’s owner was getting round groups with shots distributed at 10 o’clock, 2 o’clock, 5 o’clock, 8 o’clock, and none were touching. We could have concluded that load was no good. But then, another shooter sat down behind the rifle and put the next two shots, identical load, through the same hole. Shooter #2 had his own issues with the bag and rest and eventually produced a 6-shot group that was a vertical line, with 2 shots in each hole but at three different points of impact. OK, now we can conclude the load needs to be tuned to get rid of the vertical. Right? Wrong. Shooter #3 sat down behind the gun and produced a group that was pretty much a horizontal line with almost no vertical. Hmmm… what gives? Well each of the three shooters had a different way of holding the gun and adjusting the rear bag. Shooter #1, the gun’s owner, used a wrap-around hold with hand and cheek pressure, and he was squeezing the bag. All that contact was moving the shot up, down, left and right. Shooter #2 was using no cheek pressure, and very slight thumb pressure behind the tang, but he was experimenting with different bag positions. His hold eliminated the side push, but variances in bag position and down pressure caused the vertical string. When he kept things constant, the gun put successive shots through the same hole. Shooter #3 was using fairly heavy cheek pressure. This settled the gun down vertically, but it also side-loaded the rifle. The result was almost no vertical, but a lot of horizontal. Conclusion? Before you spend all day fiddling with a load, you might want to adjust your shooting style and see if that affects the group size and shape on the target. 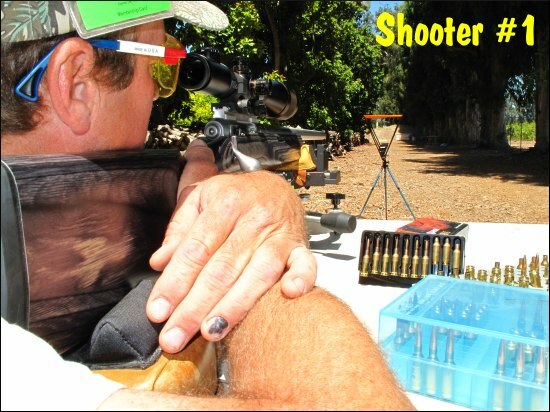 Additionally, it is nearly always useful to have another experienced shooter try your rifle. In our test session, each time we changed “drivers”, the way the shots grouped on the target changed significantly. We went from a big round group, to vertical string, to horizontal string. Interestingly, all three shooters were able to diagnose problems in their shooting styles, and then refine their gun-handling. As a result, in a second session, we all shot that gun better, and the average group size dropped from 0.5-0.6 inches into the threes. Share the post "Load Development — Changing "Drivers" Reveals Human Factor in Gun Performance"